I feel like it's been forever since I blogged! I've been busy with work,family,and Thanksgiving.. I took my boyfriend to my parent's house for turkey day,it was really nice. I finally get to meet his family around Christmas,they're all coming down and we're going to have a great time..I'm really excited! 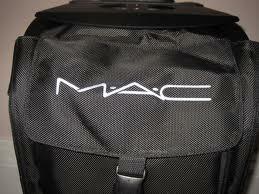 The M.A.C Pro Zuca bag! I've been making it known to my BF that this is something I reallyyy want for Christmas hehe. This is the mother of all rolling makeup cases.. It has multiple clear,plastic zip compartment bags to hold various cosmetics.. It's very spacious,and doubles as a seat on the top of it! Talk about multi-tasking..the Zuca does it all! This puppy isn't cheap..it comes in at a whopping $279,however I think for the working makeup artist,the price is justifiable. You can only purchase this online if you're a member of M.A.C Pro,or if you goto one of the Pro locations. Zuca also sells them on their website,perhaps a little cheaper depending on the model that you get. What do you think of the Zuca bags?